samantha jayne: Ebay Wishlist | Animal Edition. Ebay Wishlist | Animal Edition. I love eBay. I can spend many hours scrolling through the endless amount of clothes looking for a bargain. At the moment I am desperately trying to save my pennies for a holiday and eBay is an excellent way to buy clothes that I like without making a huge dent in my purse. 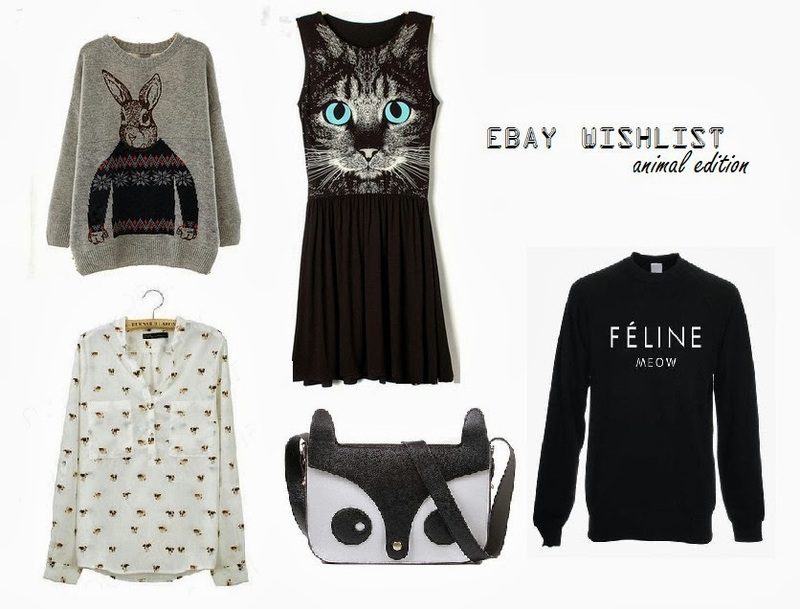 This eBay wishlist theme is animal. I'm always buying jumpers, bags, shirts and so on, with some connection to animals and have done since I was little. I think it all started when I was younger and wanted to be a vet and has just carried on since! This is first on my wishlist. I think the jumper is just adorable and the price isn't too bad either! I feel now it's getting colder that I need a few more jumpers in my life and this would be the perfect addition to my collection. I've seen this cat dress floating round before but was never too interested in it. I think it was because the photo's gives the impression that the dress is more cottony than the skater style dresses that I would normally wear and wasn't sure if this would be flattering on my figure. However, I love the dress and although the chances are that I won't buy it, I can wish for it and admire it from afar. Shirts are one of my favourite pieces of clothing to have in my wardrobe. I think that they are timeless and can be worn for any occasion when partnered with the right thing. This shirt has tiny dogs heads printed all over it and for £6.49 might be making its way to my ever growing shirt collection very soon. One thing you should know about me is that I love owls. Anything and everything with owls on always grabs my attention and this little bag is no different. It's just adorable. My only worry is if it has enough room for the amount of items I normally drag round in my bag with me. Okay so this isn't exactly the same league as the others, but it says meow? I have seen a lot of these floating around on the internet and in magazines etc. eBay has lots of these right now varying in prices, designs and colours, I just feel spoilt for choice.